Fucus vesiculosus is the scientific name for a species of brown seaweed called bladderwrack; as such, extracts of fucus vesiculosus are commonly referred to as bladderwrack extracts. Bladderwrack is found in abundance on the Atlantic and Pacific coasts from Europe to Asia. 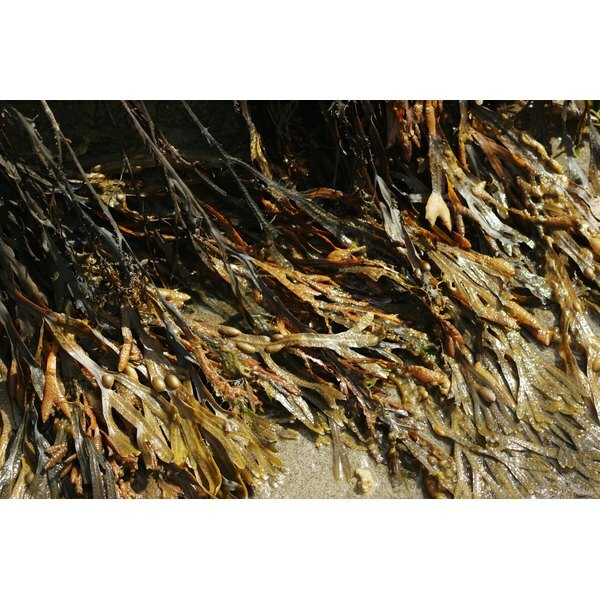 Bladderwrack is consumed as food and sold in extract form for a variety of medicinal purposes. However, don't use Fucus vesiculosus without your doctor's approval. Bladderwrack extract contains antioxidants that help to prevent free radical-induced damage in your body. Bladderwrack also has antibacterial properties and anti-hypertensive properties, which means that it helps to reduce high blood pressure. According to Phyllis Balch in her book “Prescription for Nutritional Healing,” bladderwrack is a rich source of vitamins, especially the B vitamins, as well as many valuable trace elements and minerals. Bladderwrack extract is used in traditional medicine as a weight loss aid to treat diabetes, to reduce hair loss, to reduce fatigue and to treat menstrual abnormalities. Bladderwrack extract is reported to promote brain tissue and membrane health and to encourage healthy nails and blood vessels. Extracts are also used topically to help improve skin tone, increase skin elasticity and reduce cellulite. These uses are based primarily on anecdotal evidence, however, and further studies need to be done to confirm the efficacy of these claims. Bladderwrack extract is rich in iodine. Hypothyroidism is a disorder where the thyroid is unable to properly manufacture thyroid hormones. Iodine deficiency is a common cause of hypothyroidism. As such, Fucus verisculosis extracts are used in traditional medicine to treat iodine deficiency-induced hypothyroidism. Memorial Sloan-Kettering Cancer Center, or MSKCC, states that bladderwrack extracts demonstrate chemopreventive properties, meaning they help to prevent the growth and spreading of cancer cells. In fact, bladderwrack consumption is believed to be responsible for the reduced risk of estrogen-related cancers in Asian populations. When taking a liquid extract of bladderwrack, the National Institutes of Health recommends consuming between 4 ml and 8 ml a day. Consumption of bladderwrack extracts harvested from polluted waters can cause toxicity due to the presence of heavy metals such as mercury and cadmium. No serious adverse effects have been reported from the consumption of bladderwrack extracts. Due to its high iodine content, however, bladderwrack supplements may cause or worsen acne. Bladderwrack can also cause stomach irritation and increased salivation and a brassy aftertaste in the mouth, according to the NIH. Children and pregnant women shouldn’t take bladderwrack due to the high iodine content. MSKCC warns that bladderwrack should also be used with caution in people with hormone-sensitive cancers such as breast and ovarian cancer. In addition, bladderwrack has anticoagulant properties, and people with bleeding conditions or those who will be undergoing surgical procedures or major dental work should not use it. Due to the potential for side effects and drug interactions, you should talk to your health care practitioner before supplementing with bladderwrack.